Organisers of Landscape Photographer of the Year have promised to review their judging procedures after they were forced to disqualify the winning image. On Friday, Landscape Photographer of the Year 2012 winner David Byrne was stripped of his title and £10,000 winnings after judges ruled he used too much image manipulation. Byrne has since said he did not read the rules, admitting that he digitally added clouds and ‘cloned out small details’ on a b&w image of Lindisfarne Castle in Northumberland which triumphed over thousands of other entries. However, he claims the changes he made were ‘not major’. Byrne told Amateur Photographer that he has received many emailed messages of support since being disqualified. ‘I don’t feel I have done anything wrong with the photo – adding clouds and removing small boats from the harbour in the background was a natural thing to do in my eyes,’ he said. Certain image editing, including HDR and the ‘joining together of multiple frames’, is allowed in all categories. But, competition rules state that for ‘Classic view’ – the section in which Byrne’s image had been entered – ‘the integrity of the subject must be maintained and the making of physical changes to the landscape is not permitted’. Banned editing procedures include removal of fences, moving trees and stripping in sky from another image. Byrne’s triumphant photo had drawn stinging criticism from photographers online. Photographers Tim Parkin and Alex Nail were quick to cast doubt over certain elements of Byrne’s entry, including the way sunlight falls on the scene. Disqualifying the winner, competition founder Charlie Waite said on 2 November: ‘This is extremely regrettable and it appears there was no deliberate intention to deceive the judges. Byrne said he has never passed off his photographs as “record” shots. Charlie Waite added: ‘The integrity of the competition is very important to all involved and it was clear that disqualification was the only course of action open to us. 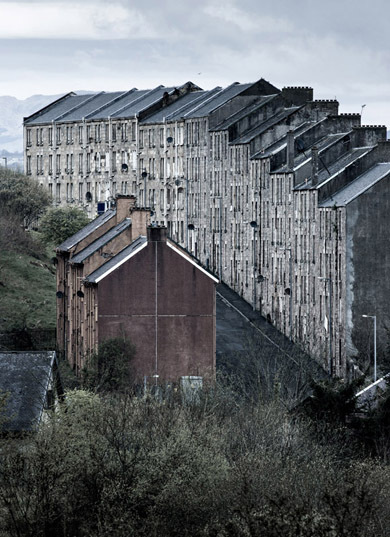 Meanwhile, a photo called ‘Tenement Buildings at Port Glasgow, Inverclyde’ by Simon Butterworth, has been confirmed as the new winner of Landscape Photographer of the Year 2012. Butterworth’s photo was the next highest scoring entry across all four categories. More than 100 of the best entries will go on show in the Take a view – Landscape Photographer of the Year 2012 exhibition at the National Theatre in London from 12 November 2012-12 January 2013. A feature article about this year’s competition appears in Amateur Photographer‘s issue dated 10 November 2012, which goes on sale on tomorrow.